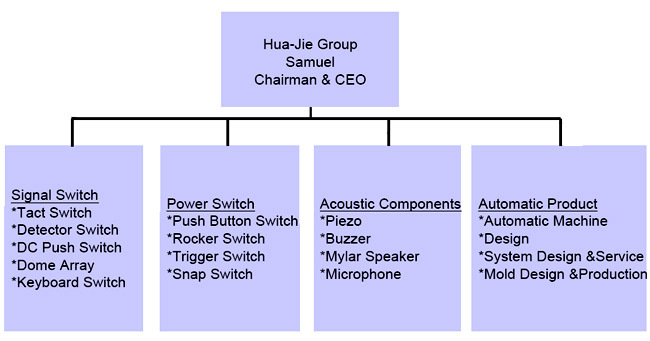 HUA-JIE (Taiwan) Corporation, headquartered in Taoyuan, Taiwan, was established in 1989, with over 25 years of experiences in R&D and manufacturing a variety of switches for all industries. In addition to our headquarter in Taiwan, we also set up Suzhou plant, Yangzhou Plant, Changzhou Plant, Xiamen plant and Dongguan Plant in China. HUA-JIE has excellent R & D designs and manufacturing experience and capabilities. Our mission is to become the world's largest three switch suppliers. For years, the switch industry did not have significant technological breakthroughs. However, HUA-JIE still dedicate our effort into research and develop better products. We only make products and provide services of which we are proud of by efficient management, differentiating our products and manufacture using fully automated technology. We put in all our effort to gain trust from our customers and will continue to build a good and long-lasting relationship with our customers worldwide. ★ 1989 Established trading with China in electronic components Exported factory equipment. Established Suzhou Plastic Production Plant . ★ 1993 Developed the Automatic Equipment for Tacting SW & TST Technology. ★ 1994 Established Taoyuan factory for manufacture of the TACT SWITCH. ★ 1996 Developed fully automated for SMD & DeFLUX Technology. 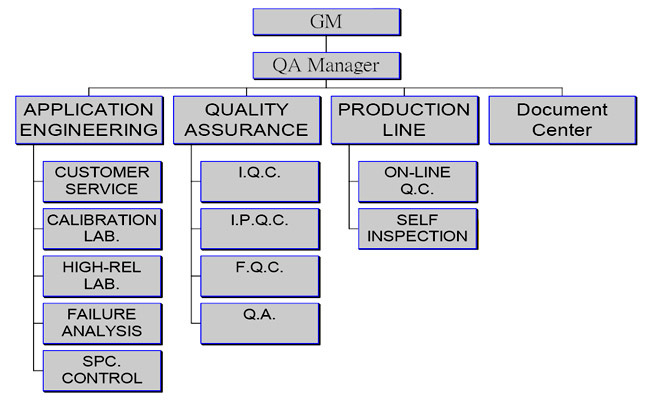 ★ 1997 Received ISO9002 certification. Developed TSVR Technology & Designed TSDR for Sony. Awarded The Best Automation Factory . Design Detector Switch (DSDA-001) for ASUS successfully. Set up HUA-JIE SuZhou Plant. ★ 1999 Developed Long Life Switch for Logitech and Encoder Switch. ★ 2000 Developed Side push switch for cell phone applications to MOTOROLA. ★ 2001 Merged Himake & PAC and extend to Micro switch & acoustic product. ★ 2002 Move Taiwan factory from Taoyuan to Jhongli Industrial Park. Public issue stock in Taiwan on Nov.14. ★ 2003 All of plants of Hua-jie passed ISO9001:2000 certification. Received 2003 Chinese Yearly Excellence Achievement Golden Torch Award. Awarded A Model on Factory Automation. ★ 2004 Suzhou Hua Jie plant passed ISO 14000 certification. ★ 2005 Green partner of Samsung. ★ 2006 Developed tact switch and speaker for NAVMAN, the GPS leader. Xiamen Himake passed ISO 14000 certification. ★ 2007 Yangzhou ZhanSheng Plant established. Xiamen Himake passed ISO/TS 16949 certification. ★ 2008 Developed door switch for GE. ★ 2009 Combined Xiamen plant and Dongguan plant ,and moved to new plant in Xiamen. ★ 2010 Cooperated with HP and Lexmark for new Micro switch projects. ★ 2012 Smart Factory – K2 in Taiwan. Professional Technology, Excellent Quality,Create a First-Class Enterprise. Positive Attitude, Honest Service,Customers’Best Partner. Quality Enhancement, Talent Cultivation,Fruits Sharing with Employees and Customers. Participate in the None-Profit Activity,Contribute to Society, Hua-Jie add Care for Society.